AF Rayspeed 200cc TS1 Cylinder Kit-The worlds number one performance kit for 200cc Lambrettas. The cylinder is aluminum alloy with a nikasil plated bore, which provides optimum heat transfer and drastically reduces the chance of piston seizure. 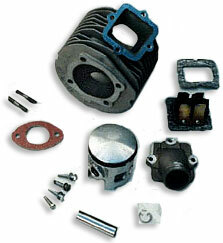 Porting includes an integral reed valve intake, five transfer ports, and a single exhaust port. Rayspeed claims 27.6hp for the 200cc kit, as compared to about 11hp for a stock GP200. The intake manifold will accept carburetors from 30-35mm, with a 32mm flat slide Mikuni (WCLW #453) being an excellent choice for all around road use. 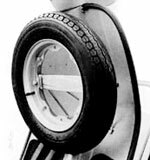 The carb is relocated to the right hand (kickstart) side of the engine compartment, and scooters with a battery will need to have the battery tray cut off and relocated to the opposite side of the frame. The cylinder kit includes the cylinder, Asso piston with two rings, wrist pin, circlips, reed valve assembly, intake manifold, hardware, and all gaskets. We recommend using wider Kawasaki wrist pin bearing #0205.B without piston shims.